President Obama rides a bike during a vacation on Martha’s Vineyard in 2013. 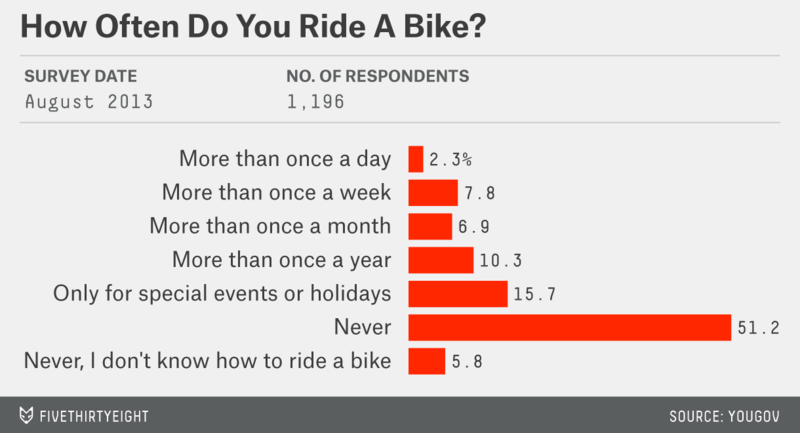 How many Americans don’t know how to ride a bike? It always blows my mind when I meet someone that can’t, especially since I ride mine daily. In August 2013, YouGov commissioned a survey titled “Bikes & Edward Snowden.” Thankfully, the survey treated the two topics separately — I’ve yet to receive a Dear Mona question that asks about Edward Snowden’s cycling habits. (It’s actually pretty common for pollsters to tack on some extra questions about, say, horsemeat to a survey about working remotely — it saves them time and money.) And so, Brandon, I have an answer for you based on the responses of 1,196 U.S. adults: 6 percent of Americans don’t know how to ride a bike. The results (that link will take you to an Excel download) are broken down further, so I can tell you who is the least likely to know how to ride a bike. In the Northeast, 12 percent of Americans said they didn’t know how to ride a bike compared to just 3 percent in the Midwest (it was closer to the national average elsewhere — 5 percent in the South and 6 percent in the West). White Americans are the most likely to know how to ride a bike. Only 4 percent said they don’t know how, compared to 7 percent of Hispanic Americans and 10 percent of black Americans. Married Americans were half as likely as single Americans to not know how to ride a bike (4 percent compared to 8 percent) — a fact that might be related to those numbers on race. There were two pretty big surprises in the spreadsheet. I was expecting young Americans to be better on two wheels, but they’re not. Nine percent of those ages 18 to 34 would probably fall over sideways if they attempted to ride a bike compared to just 3 percent of those age 55 and over. Gender was the other big surprise. I expected a gap between male and female non-riders, and there was one: 60 percent of women and 42 percent of men said they never ride a bike even though they know how — I’ve looked at the various reasons for that in the past. So based on that previous research, I expected a similarly big gender gap in the percentage of Americans who don’t know how to ride a bike. But as it turns out, there’s barely any difference between the share of women who say they can’t ride a bike (6 percent) and men who say the same (5 percent). Overall, Brandon, it looks like you’ve got a case of the old cognitive bias. You might be shocked every time you meet one of those 6 percent of adults who can’t ride — but that’s probably partly because you’re such a keen cyclist. In fact, there are more Americans who don’t know how to balance on a bike than there are daily riders like you.